For my amazing nephew, Heath Lemmonds of Dallas, Texas. 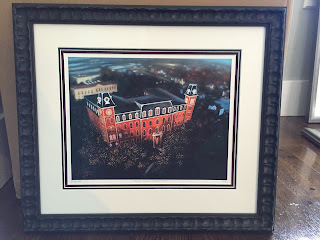 Heath is a University of Mississippi graduate (BA, MBA). The tower was built in his freshman year, and was near the ATO house where he lived. 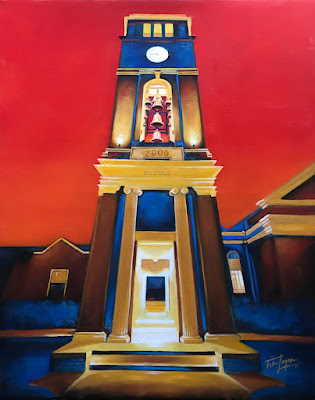 I used several reference photos for the painting, and chose to accentuate the blue evening shadows and place it against a brilliant red sky to convey the university's colors. The Peddle Bell Tower and carillon were a gift to the university from Frank and Marge Peddle of Oxford. 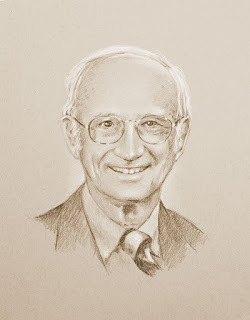 Heath worked at the University Club while at Ole Miss and often served the Peddles. After a slow year working on a single painting, I wanted to take a break and do something a little different from my usual, so this is a journey into a mind's image, a wandering forest trail that leads to a brightly lit clearing. 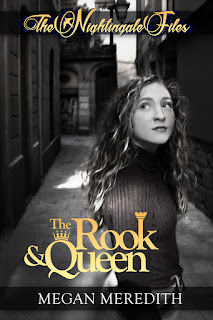 It was a privilege to design the cover for Megan's new book, "The Rook and Queen." Available on Amazon, of course! There's a new shop in town! Aaron Randall's Frame Fayetteville opened recently at 200 College Avenue in Fayetteville. 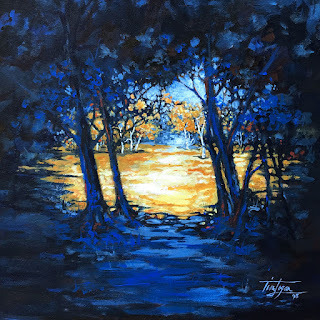 I'm very honored that he asked for several prints of my paintings. Go by and have a look. He's got a great eye for framing, and I'm certain he can help you with any project you need. 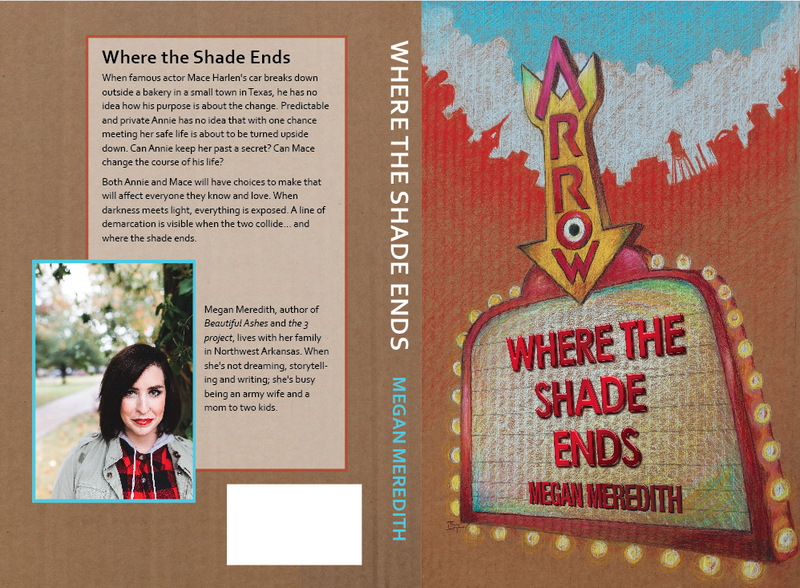 Author Megan Meredith asked me to design the cover for her new book, Where the Shade Ends, soon to be available on Amazon! Had a lot of fun with it, opting for colored pencil on cardboard for the art. Hope you'll get the book - I believe it comes out in April. 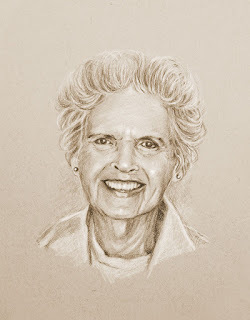 Pencil portraits of my wife's parents, Glyn and Bettie Nell Hollingsworth. Glyn passed away nearly three years ago. Bettie Nell wanted a portrait of him so she could give prints to her three children and seven grandchildren for Christmas. 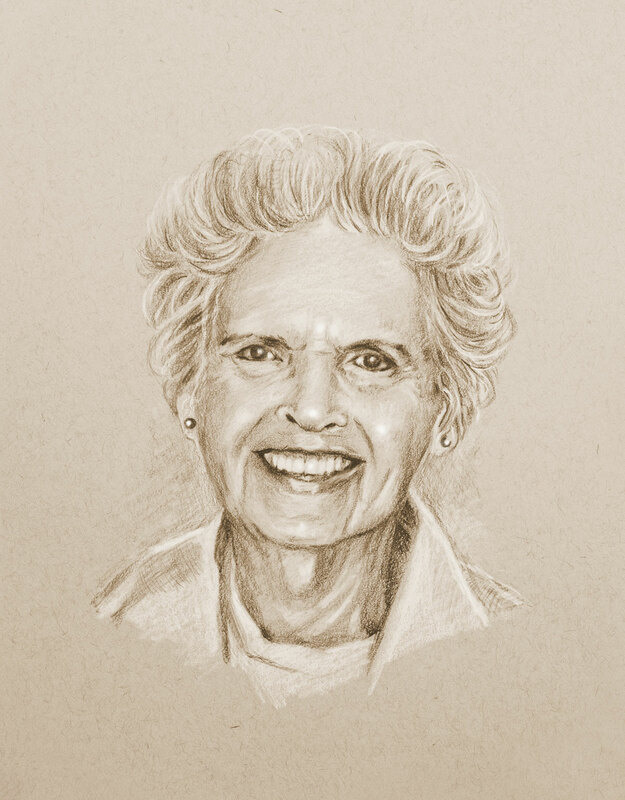 I surprised her by doing a portrait of her as well, and gave both prints to everyone. These are colored pencil on brown paper. 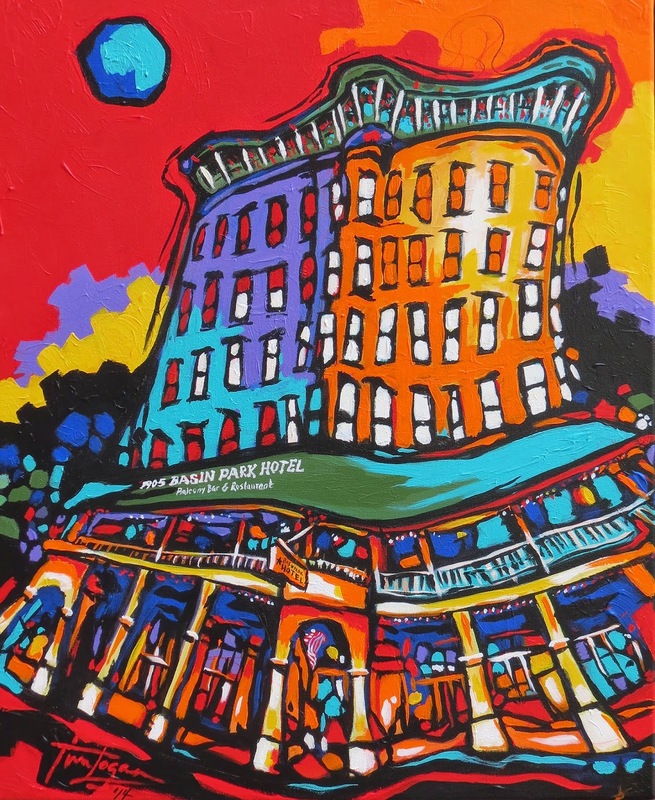 "Yellow Diamond" is a new Eurekan architectural I delivered today to Norberta Philbrook Gallery in Eureka Springs. Leslie and I, with my sister, Jo Ellen Logan, drove over on this very beautiful near-fall day and enjoyed lunch at a wonderful little restaurant named "Fresh." Ever had Cream of Parsnip and Anise Soup? Wow, what a treat. Absolutely perfect consistency and temperature, with an exotic flavor I've never tasted before. Must have been the anise. 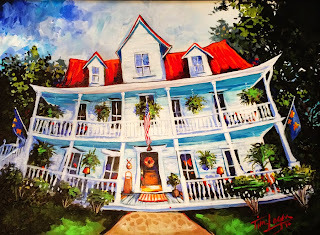 We dropped the painting off before lunch, promising to return afterward to visit with Ron, who mans the shop on Sundays. 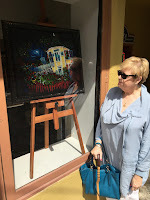 When we returned, the painting was in on an easel in the front window awaiting the right buyer! See photo of Jo Ellen peering in below. 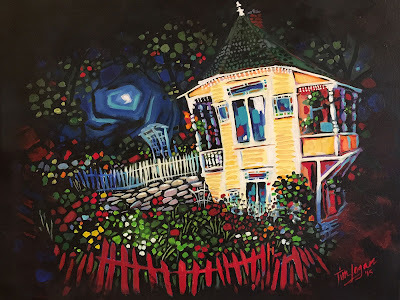 The tiny, multifaceted gem of a house is a delightful find, wedged at a tight fork in the road, one tyne going upward, the other downward, a la the wonderful world of Eureka. I photographed it a few times on previous visits, always intrigued by the curious juxtaposition of the little structure with its lacy, Victorian appointments, stained glass windows, and free-form garden and yard decor. 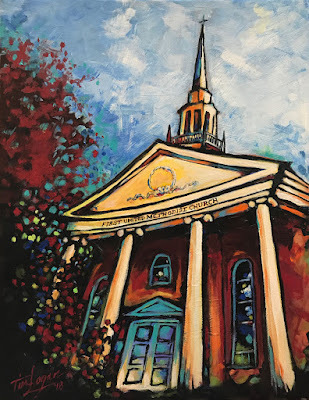 It was begging to be painted! 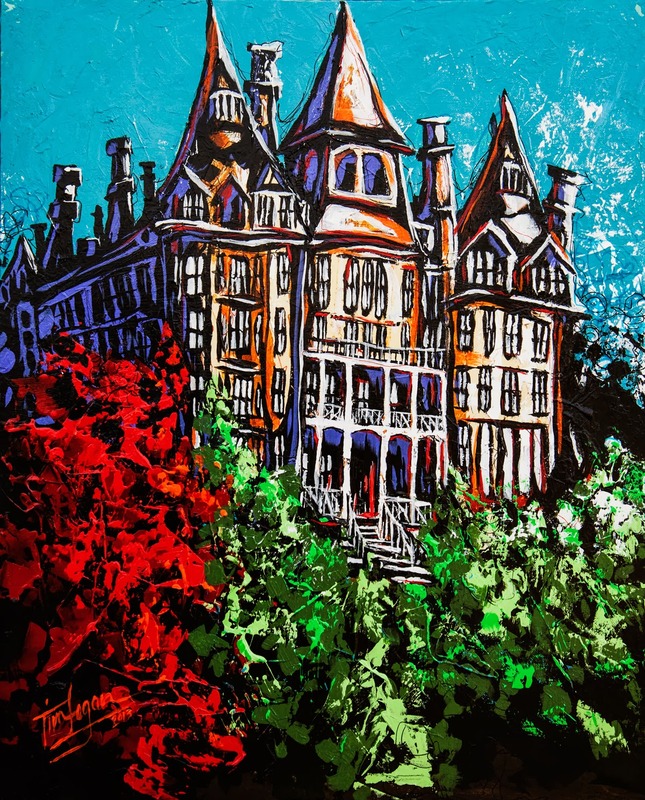 "New Moon," my Crescent Hotel (Eureka Springs) homage, has found a home! Thank you to Ron and Raven at Norberta Phibrook Gallery in Eureka for arranging the adoption. I'm smiling because "Mount Victoria Smiling" has a new home! 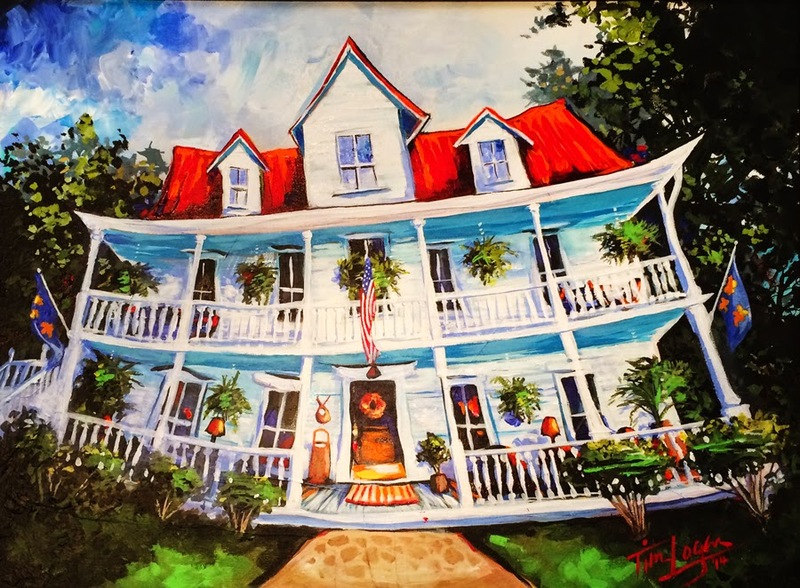 Fellow NWA artist, Jan Ironside, purchased it as a gift to her daughter and son-in-law, who spent their honeymoon in the Eureka Springs bed-and-breakfast depicted in the painting. 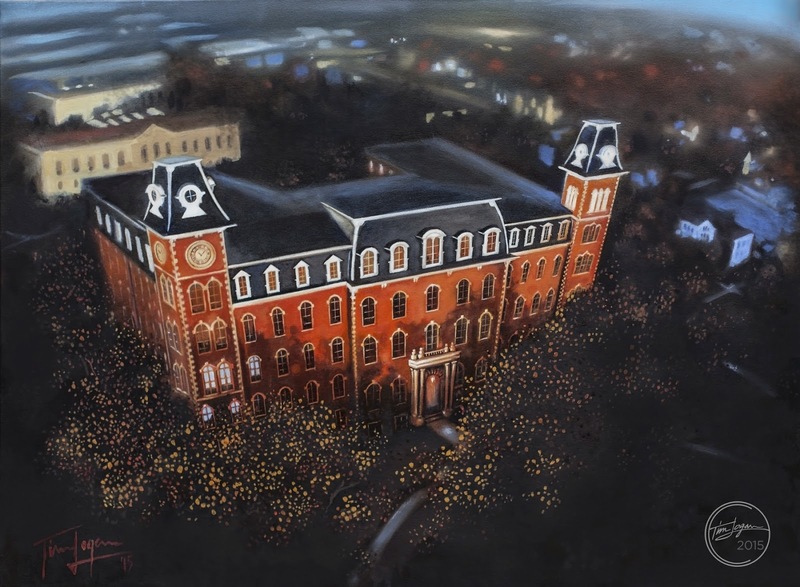 Old Main at the University of Arkansas is the quintessetial landmark, not only for the campus, but for all of Northwest Arkansas. It's probably one of the most recognizable buildings in the state. I hope I've done it justice. I used a few photographs from the internet to compile the angle and surroundings. I'm indebted to those photographers, and would credit them if their names were available. I wasn't in the mood to get in a helicopter and shoot it myself! Not gonna do it. This painting was the request of my niece Elizabeth's husband, Luke Harper, who is finishing seminary at Mid America Seminary in Memphis and is on the staff of Bartlett Baptist Church in Bartlett, Tennessee. He wanted a little bit of Arkansas (they both graduated from U of A) for his office. 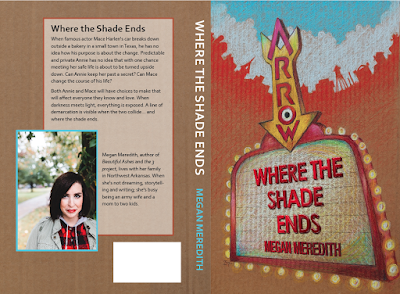 I've been working on it in spurts since late October (2014), and finally called it finished a couple of weeks ago. 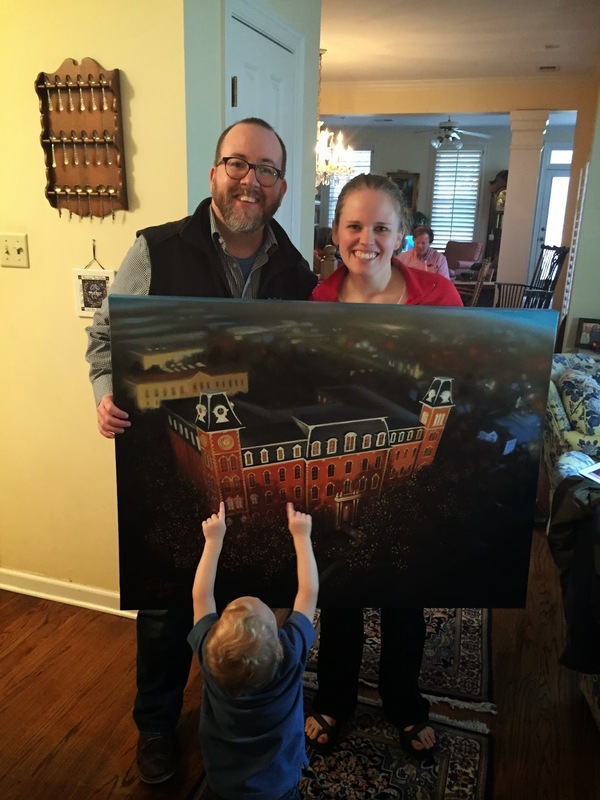 Luke reports that the painting is no longer bound for his office, but for the mantlepiece of their home. I'm honored. 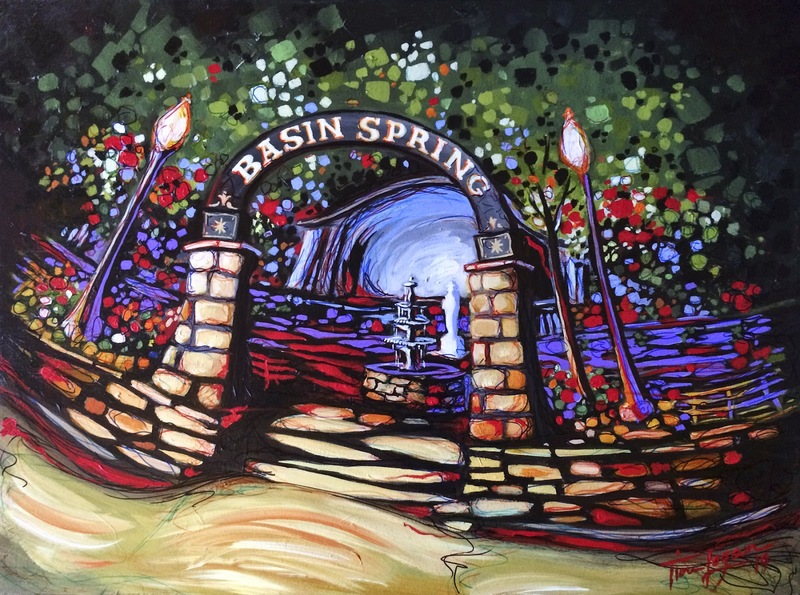 This one has a new home with Pat and Lee from Out on Main Gallery. So sorry to see the gallery close, but it sounds as though they have great plans and new directions, so I wish them well! 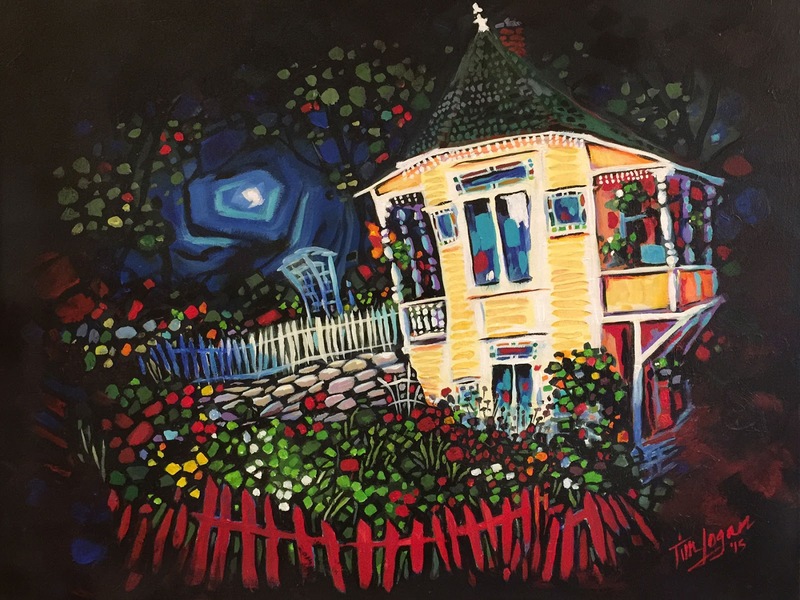 Thanks for the time in the gallery, and for helping a number of paintings find homes. I couldn't decide whether it was day or night, so it's both. An amalgamation. Night and Day, you are the one. All dressed up for a night on the town. Night time is the right time. Blue moon. Red sky at night. Red sky at morning. Moonlight becomes you. Sunrise, sunset. Make of it what you will. This is by request from Pat and Lee at Out on Main Gallery in Eureka, for one of their regular clients. Hope they enjoy! 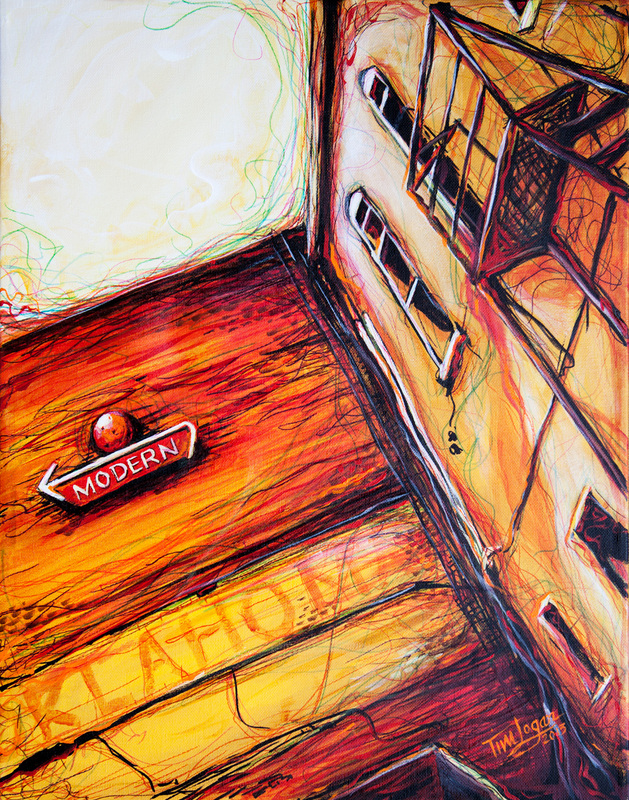 "Modern Times" sold on September 12 at the A Street Gallery in Bentonville. Thanks, Scott, for a quick sale! The man who constructed and installed the "modern" sign is a Texas 3-D sign artist. He was commissioned by a "local family" to do this sign, and he said he's supposed to be doing more, but that was a while ago and I haven't seen any yet. Hope we do! This sign is in a back-alley behind Table Mesa Restaurant (on the square).